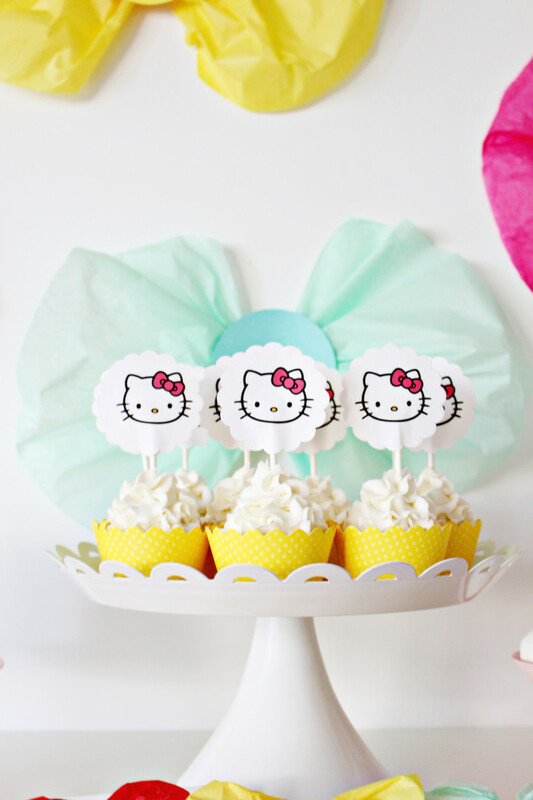 A “Bow”-tiful Birthday Party for Hello Kitty! 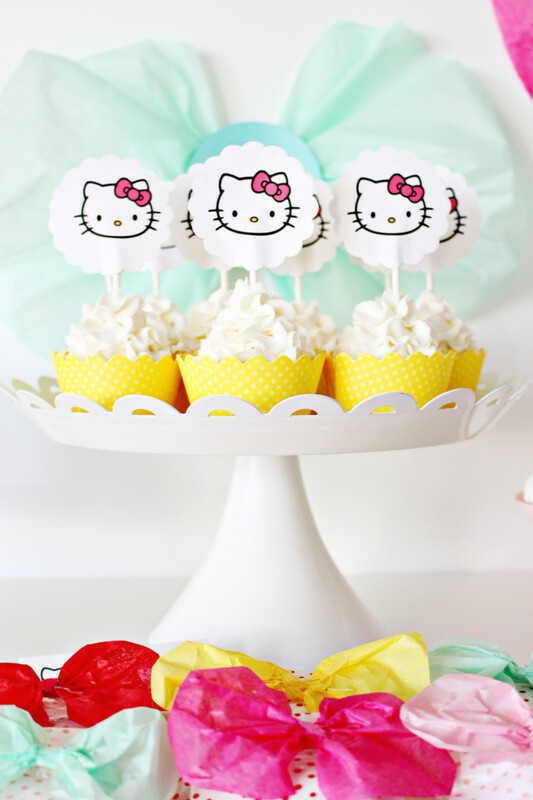 Today is Hello Kitty’s birthday :D didn’t you know?! 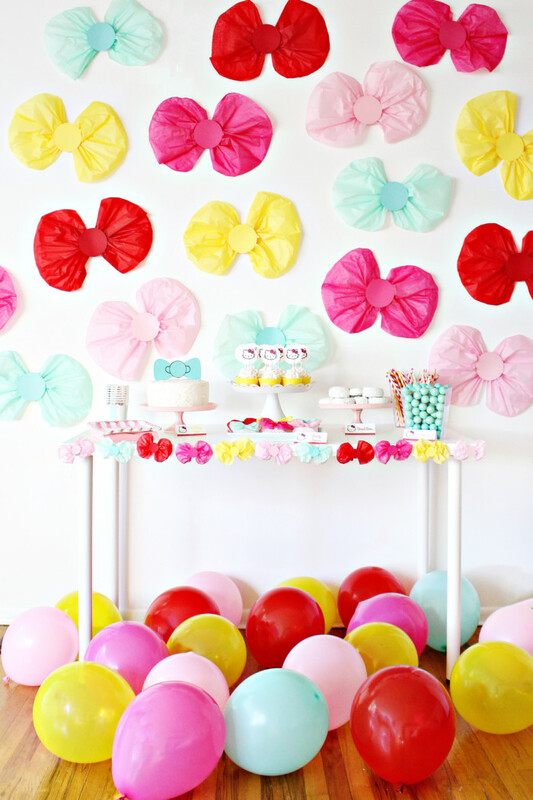 Haha, don’t worry we didn’t either until about a month ago when we were planning this bow-tastic birthday party set up! Truth be told, we’ve never been into many character things at all. Even as children, neither Malissa or I (or any of our siblings for that matter) were fanatic for a certain character, show, or company (like Disney). I guess that’s just not how we were raised. However, I do distinctly remember that we had a Sanrio (the company that created Hello Kitty) store in one of our local malls throughout jr. high and we LOVED it there! They had the cutest little products and amazing pens and pencils! As someone who prided herself in having the coolest writing utensils, i.e. totally unnecessary little doo-dads added onto them, I loved going to the Sanrio store and picking out fun new ones to add to my collection. Additionally, and more importantly than the cool pens they had, this store had the most AMAZING selection of bubble gum. They seriously had packs of blueberry bubblegum, banana bubblegum, strawberry, pineapple and every other fruit flavor imaginable! Plus, a bunch of other unique flavors. Because bubble gum is my FAVORITE, I could not resist buying a couple packs every time we went to the mall. So, while I maybe never have had a Hello Kitty full-on get up, I had plenty of fun little gadgets and bubble gums with her cute little head on them. And I have always thought she was possibly the cutest little cartoon character out there! She’s always featured in new little outfits and bows and I just love that about her. In fact, I think her bow is so cute that I decided to throw a whole little party based on the accessory! 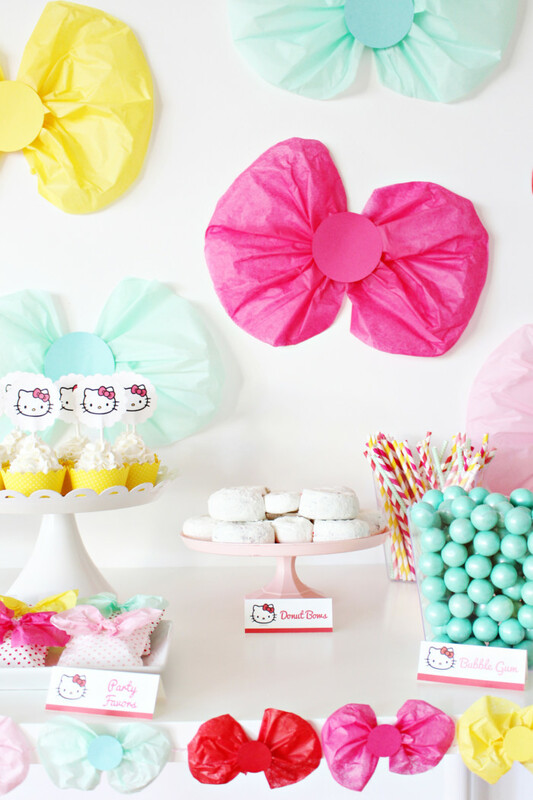 For this party, we used a bunch of Avery products and the Hello Kitty printables and then decked the whole thing out in bows of all sizes! I loved this theme because I know how versatile these bow decorations can be. 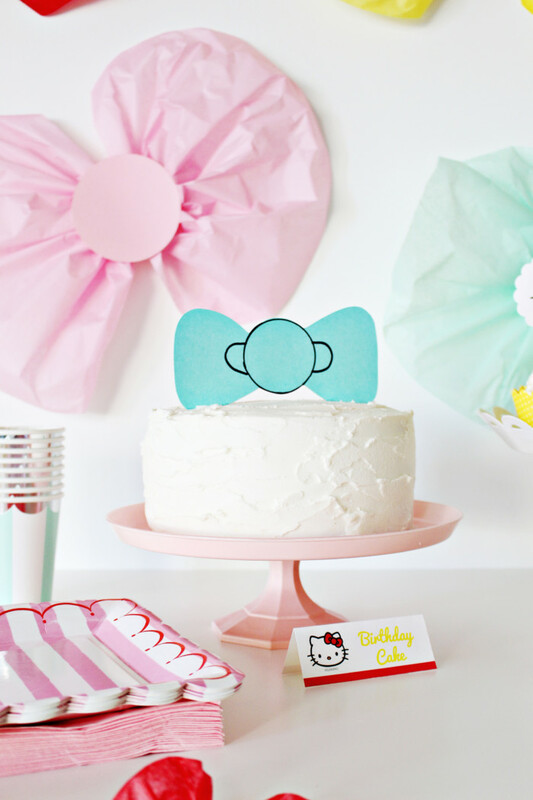 Planning a gender reveal soon? Do a “hair bow or bow tie?” theme! Or, even if you do bows or mustaches party, or any other combination of girl/boy accessories, these bows are perfect for at least half of the decor! 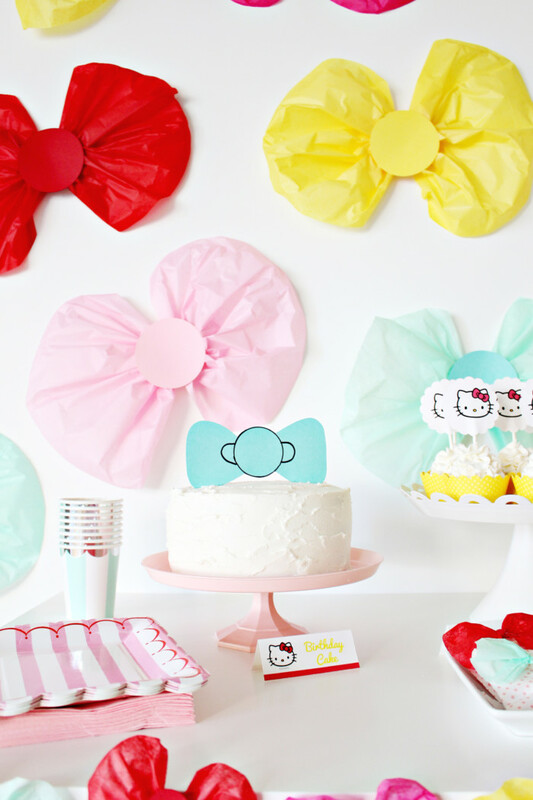 Also perfect for a baby shower where you can celebrate the upcoming little lady or tiny gent. Bows are of course suitable for girls of all ages and even bridal showers! 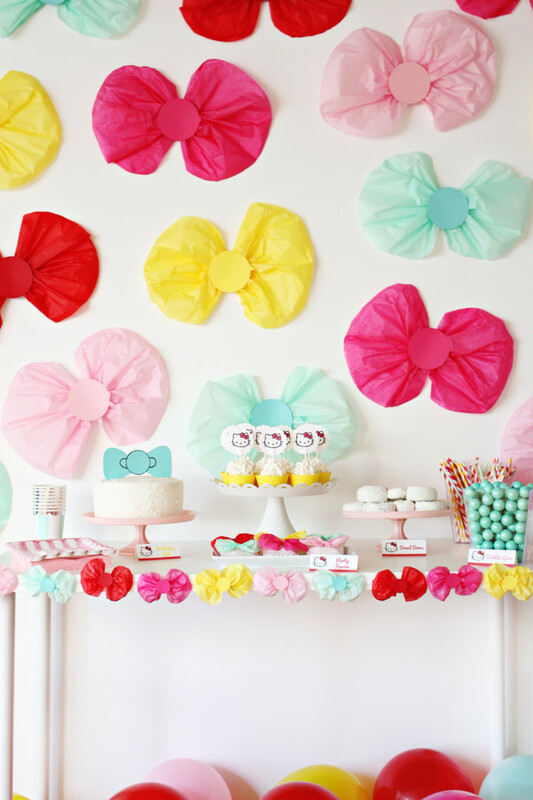 Or, adjust the decorations a little (mostly color-wise) and you have a bow tie theme birthday for a little boy! So many options! Is your daughter into Minnie Mouse instead? She also wears a bow! So this party is perfect for that as well. Everything we put together was super easy. In fact, I am totally IN LOVE with how easily this party came together, it was a breeze! 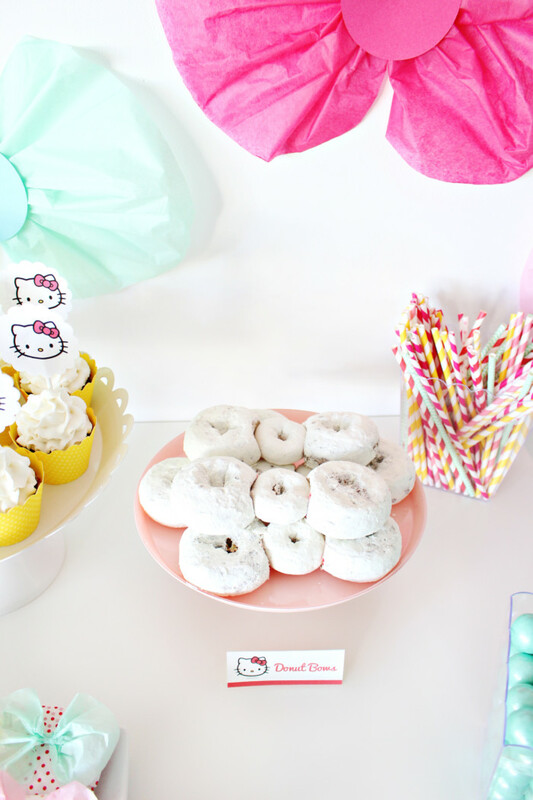 A few treats, like a cake, red velvet cupcakes, and bow-donuts, create a cute tablescape practically on their own. 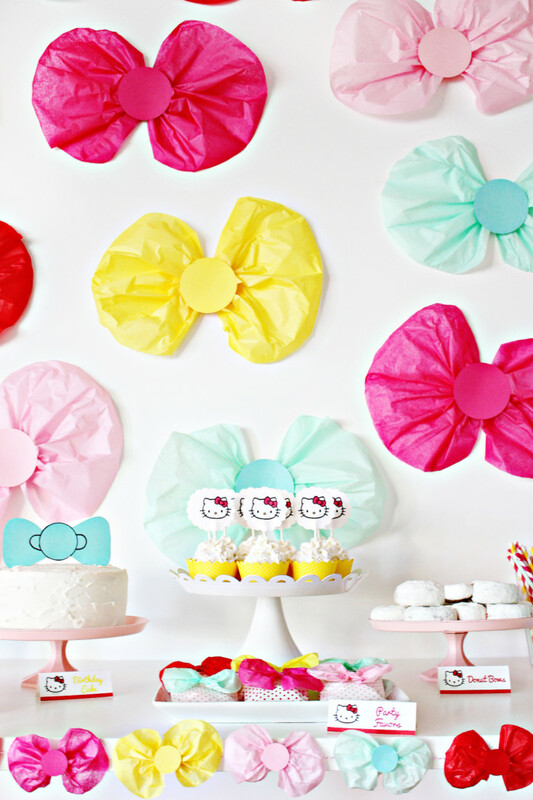 To really take it over the top though, we created a wall of tissue paper bows (so easy!) behind the table. A tiny version of those bows made it on to a garland. And mini bows also adorned the favor bags. All of the sources are at the end of this post! 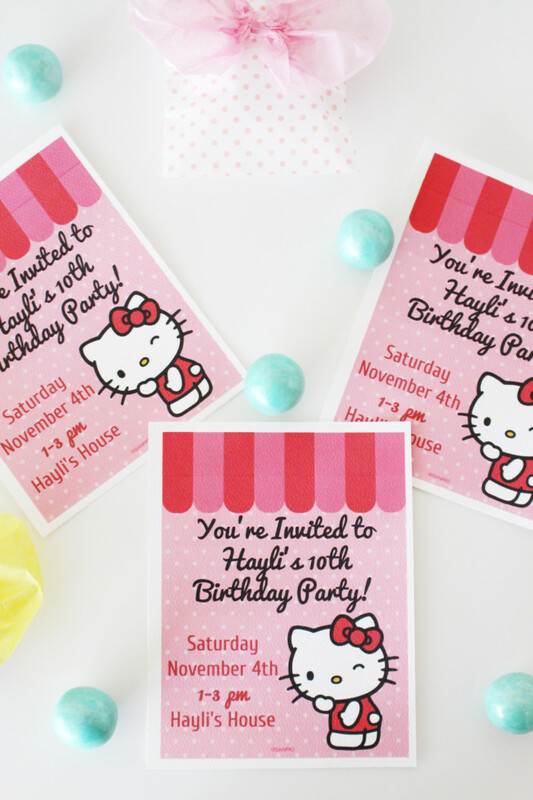 Then, to bring Hello Kitty into the festivities, we jumped on Avery’s Design and Print software and printed a bunch of stuff out! Ok, I NEED to give a little shout out to this software. I find it extremely rare to find a product like this that works well. Usually when you have to jump onto a company’s website in order to make their product, the program is super glitchy or slow. That is NOT the case with Avery’s program! It was not only flawless, but extremely easy to navigate. And everything printed out PERFECTLY. You know how frustrating it is to spend time on a project and have it be ruined in the printing process because it’s not calibrated correctly. That won’t happen with their software! Every product I’ve tried has been flawless. No wasted paper or labels to speak of! We used their note cards, postcards, scallop labels, and table tent signs to make all the printables for this party. On Design and Print you can basically add or subtract anything you want! Text is super easy to add and customize (different colors and fonts!) 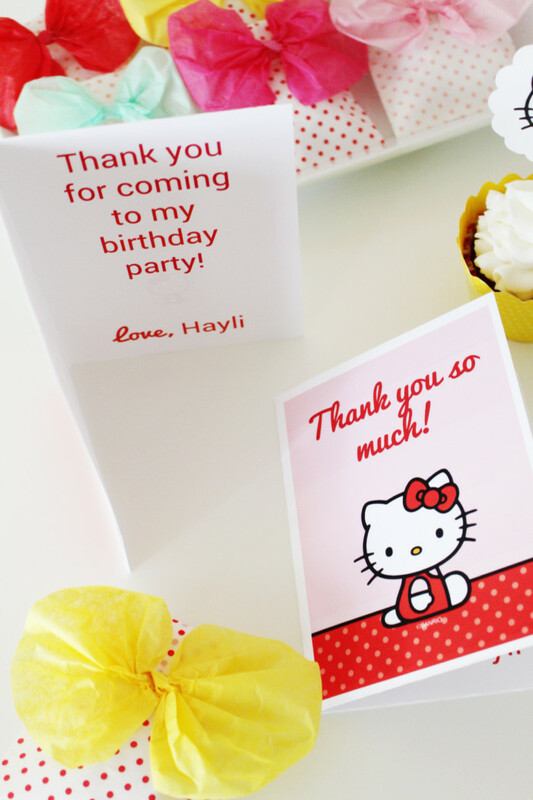 And add additional Hello Kitty images to your design to switch things up. You can even unlock the background image if you want to change the size or placement of one of their pre-made designs. Plus, I learned that if you go to a specific product, you can find a lot more Hello Kitty designs that aren’t shown on the Hello Kitty templates page. For example, here I chose the scallop label and then the Hello Kitty category; you can see there are 20 different designs shown there as opposed to the 4 shown here. Avery sent us all their products for free in exchange for this post. We weren’t paid and all the opinions on the product and program are our own!